CBC News reported last week of an investigation for harassment of inmates and staff at Edmonton Institution. 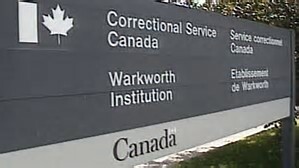 A similar situation may be underway at Warkworth Institution, by population Canada’s largest federal penitentiary. Northumberland 89.7 has learned that the Ottawa consulting firm, Quintet Consulting Corporation of Ottawa is retained to survey abuses at Northumberland’s local prison. Northumberland 89.7 has learned that management at Warkworth Institution previously contracted for the installation of a stingray device to record cell phone calls coming from the prison and surrounding area. This has greatly upset residents living in the vicinity of the prison. Although the device found no operational cell phone calls from prisoners, CSC was able to monitor and record staff calls even though CSC had no warrant to do so. Sources tell us that a police investigation has been completed and a decision has yet to be taken on possible criminal charges. Northumberland 89.7 has been provided with a series of investigative photos of a bound and gagged mannequin splayed across an officer’s desk. It is suspected that other staff members were responsible for what appears to be an intimidation tactic. We have also learned that the Warden was made aware of a beheaded effigy of a staff member.